My father grips my chin and runs the edge of a comb across the top of my head to implant the memory of a part and I don’t mind that it hurts like hell. Now, here I am, prim, my unruly nest of a head flattened beneath a brown lid, feet in model pose. 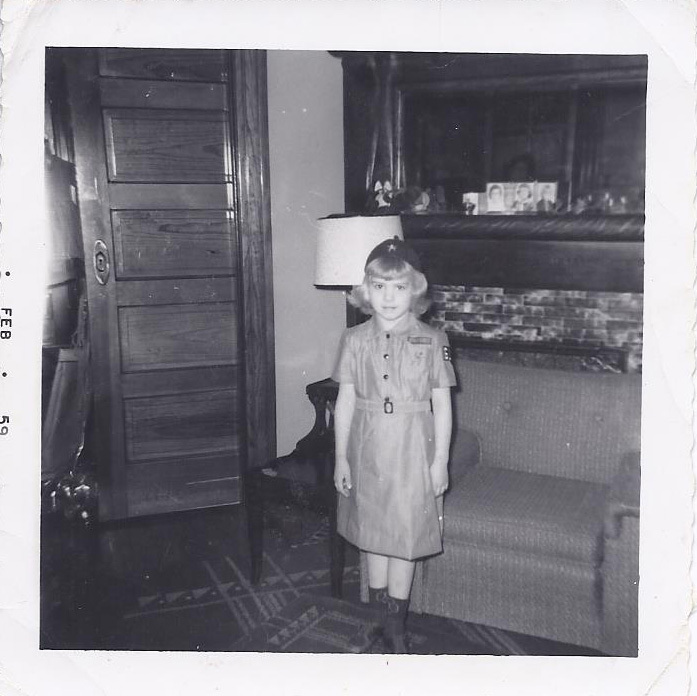 I will keep this troop 516 browndress forever and I will make new friends and keep the old, one silver, one gold, I actually believe I will obey the girl scout laws, and I am a kid who already loves smart turns-of-a-phrase, hearing music with my tongue. I am baptized by my father with my older sister’s Tabu, before posing for a picture. When I hold the photo close to my nose, I can smell it. I sit at the center of a fifties living room, a nubby green tornado-proof couch full to overflowing with others, and am that one who with her sister, ties a string across the two pocket doors between the living room and dining room almost strangling her little brother when he runs through. Here doggie, doggie, come comfort. There is no expiation, no need. I won’t ask for forgiveness for anything not from anyone, not today. The browndress is ironed smooth, pure, purer than snow; brown socks—my ankles are filled glasses of dark tea. For the first time in my life, I am a goddess, a goddess in a browndress. I walk taller, quieter in these earth tones and fold my hands into my lap—very still—and when Mrs. Jardine reads from The Secret Garden after lunch, I calmly listen. NOTE FROM THE AUTHOR: This poem started out as lineated but there was a strong impulse to make it a prose poem. I’ve been trying to better honor the writing impulses as I work. Making this prose, I was able to play with small bits of narrative, weaving it into collage of the day in a nonlinear way. I took an ekphrastic approach, focusing on what was in the picture with small glimpses and digressions. It started out having many more sections but I felt they explained too much and took the piece further than it wanted to go. 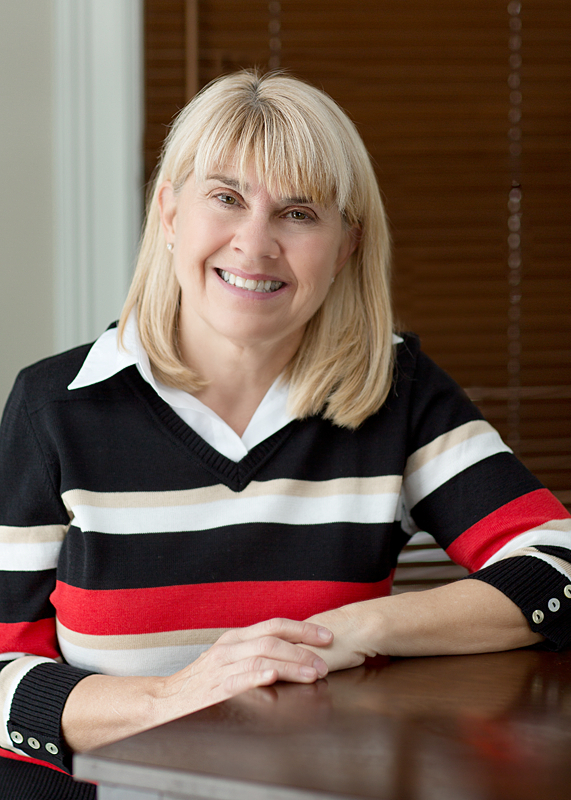 ABOUT THE AUTHOR: Grace Curtis’ book, The Shape of a Box, is available from Dos Madres Press. Her chapbook, The Surly Bonds of Earth, was selected by Stephen Dunn as the 2010 winner of the Lettre Sauvage chapbook contest. Her prose and poetry can be found in such journals as The Chaffin Journal, Sou’wester, Red River Review, The Baltimore Review, Waccamaw Literary Journal, and others. She works for The Antioch Review. Her website is www.gracecurtispoetry.com.